The ancient spruce in stately stillness receives it. Flagstones glisten like copper platters, rinsed from a day's use. 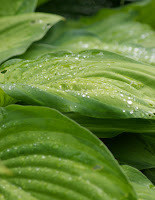 Hostas, glossy and open-palmed, quiver in delight. Weeping, a Japanese cherry bows even lower.